Astronomers have detected an atmosphere around the super-Earth GJ 1132b. This marks the first detection of an atmosphere around a low-mass super-Earth, in terms of radius and mass the most Earth-like planet around which an atmosphere has yet been detected. Thus, this is a significant step on the path towards the detection of life on an exoplanet. 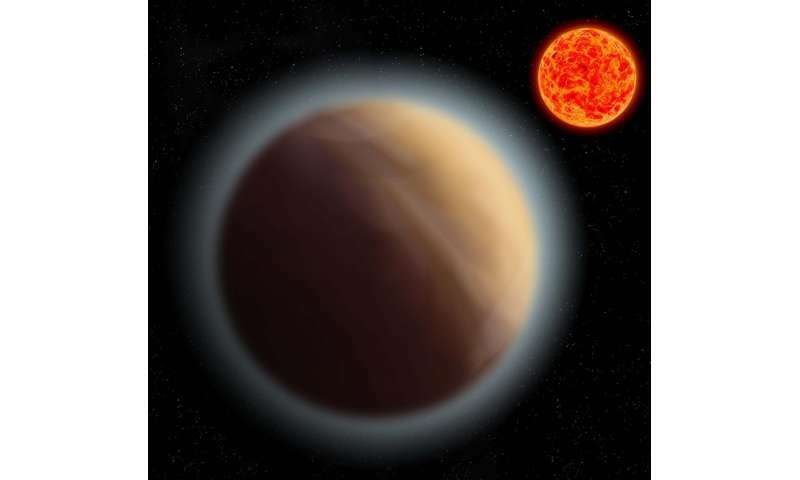 The team, which includes researchers from the Max Planck Institute for Astronomy, used the 2.2-m ESO/MPG telescope in Chile to take images of the planet's host star, GJ 1132, and measured the slight decrease in brightness as the planet and its atmosphere absorbed some of the starlight while passing directly in front of their host star. While it's not the detection of life on another planet, it's an important step in the right direction: the detection of an atmosphere around the super-Earth GJ 1132b marks the first time an atmosphere has been detected around a planet with a mass and radius close to Earth's mass and radius (1.6 Earth masses, 1.4 Earth radii). Astronomers' current strategy for finding life on another planet is to detect the chemical composition of that planet's atmosphere, on the lookout for certain chemical imbalances that require the presence of living organisms as an explanation. In the case of our own Earth, the presence of large amounts of oxygen is such a trace. We're still a long way from that detection though. Until the work described in this article, the (few!) observations of light from exoplanet atmospheres all involved planets much more massive than Earth: gas giants—relatives of our own solar system's Jupiter—and a large super-Earth with more than eight times the Earth's mass. With the present observation, we've taken the first tentative steps into analyzing the atmosphere of smaller, lower-mass planets that are much more Earth-like in size and mass. The planet in question, GJ 1132b, orbits the red dwarf star GJ 1132 in the southern constellation Vela, at a distance of 39 light-years from us. Recently, the system has come under scrutiny by a team led by John Southworth (Keele University, UK). The project was conceived, and the observations coordinated, by Luigi Mancini, formerly of the Max Planck Institute for Astronomy (MPIA) and now working at the University of Rome Tor Vergata. Additional MPIA team members were Paul Mollière and Thomas Henning. The team used the GROND imager at the 2.2-m ESO/MPG telescope of the European Southern Observatory in Chile to observe the planet simultaneously in seven different wavelength bands. GJ 1132b is a transiting planet: From the perspective of an observer on Earth, it passes directly in front of its star every 1.6 days, blocking some of the star's light. The size of stars like GJ 1132 is well known from stellar models. From the fraction of starlight blocked by the planet, astronomers can deduce the planet's size—in this case around 1.4 times the size of the Earth. Crucially, the new observations showed the planet to be larger at one of the infrared wavelengths than at the others. This suggests the presence of an atmosphere that is opaque to this specific infrared light (making the planet appear larger) but transparent at all the others. Different possible versions of the atmosphere were then simulated by team members at the University of Cambridge and the Max Planck Institute for Astronomy. According to those models, an atmosphere rich in water and methane would explain the observations very well. The discovery comes with the usual exoplanet caveats: while somewhat larger than Earth, and with 1.6 times Earth's mass (as determined by earlier measurements), observations to date do not provide sufficient data to decide how similar or dissimilar GJ 1132b is to Earth. Possibilities include a "water world" with an atmosphere of hot steam. The presence of the atmosphere is a reason for cautious optimism. M dwarfs are the most common types of star, and show high levels of activity; for some set-ups, this activity (in the shape of flares and particle streams) can be expected to blow away nearby planets' atmospheres. GJ 1132b provides a hopeful counterexample of an atmosphere that has endured for billion of years (that is, long enough for us to detect it). Given the great number of M dwarf stars, such atmospheres could mean that the preconditions for life are quite common in the universe. In any case, the new observations make GJ 1132b a high-priority target for further study by instruments such as the Hubble Space Telescope, ESO's Very Large Telescope, and the James Webb Space Telescope slated for launch in 2018. Typically hiding information for sale empty stories. Another piece of missing information is the working temperature for their planetary models is 600 K (about 620 F). It appears the atmosphere is hundreds of miles thick. Perhaps most importantly, because the planet radius differs dramatically based on wavelength, we may be able to measure atmosphere height on some of these exoplanets. Why do they use the term 'Earth' when describing these newly found planets, thus conveying to the average non thinking person that they are in some way like Earth. Yes, they are planets and Earth is a planet but that is not to say they have any other connection to Earth. The phrase "super Earth" ("super-Earth", "super earth", "super-Earth", and other mixes of hyphens and capitalizations) is nothing more than a quick and easy way of indicating that the planet is rocky, with a mass anywhere from a smidgen greater than to about ten times the mass of the particular Earth on which we're sitting or around which we're orbiting. It's quick and dirty jargon, not a technical term. I do not believe there's any intent to confuse, deceive, or exaggerate. How can anyone, especially any logical thinking mind, possibly still not see that one CANNOT 'stand' ('land', 'drive'), let alone 'live sideways' on any curved periphery- the opposite of a straight line|flat surface (see the definition of the tangent)- as can be seen in earth's still, FLAT horizon vs the ROUND, orderly and observably rising and setting (MOVING) sun and moon? In acrobat and circus artist circles, it's called "ball WALK", because the feet must keep moving as one can only balance on the "North" of the ball. Jesus. A flat Earther! I thought they'd died out. Evolutionarily inevitable when you have the IQ of a brain damaged trilobite. All celestial objects? You mean like the Sun? A spheroid. Clearly. Just look up. The moon? Also a spheroid, made all the more evident by its phases. The Earth? We have satellites and space stations.. orbiting and taking pictures. It's round. You just cannot possibly be that stupid. Can't be. I doubt you'd be able to function in the modern world, or even use the internet for that matter. Therefore, you're either a particularly lame troll, or you're quite seriously mentally ill, and desperately need help. I hope you're just a troll.